edu-sharing is a cloud storage for learning content developed in collaboration with educators. Unlike commercial services like Dropbox or Google Drive, you can install edu-sharing on a server of your choice. This keeps your data under your control. Embed your content into your preferred platform using our Moodle, OPAL, ILIAS or MediaWiki plug-ins. Centralized storage makes changes to your materials visible everywhere instantly. Your personal edu-sharing cloud storage and its group folders can be integrated into your Mac Finder or Windows File Manager like a network drive. This way you can open your content directly from edu-sharing and edit it with your favorite authoring tool. 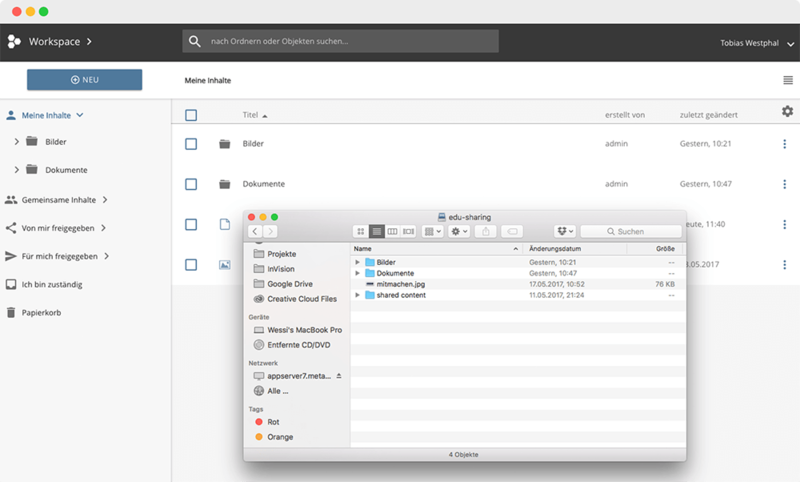 Bundle your internal and external content sources and file stores and access them with a convenient search. Thanks to our automatic full-text indexing, with edu-sharing, unlike other cloud services, you can not only search the title but also within the actual contents of your documents. edu-sharing offers its users a one-field search as well as a configurable, advanced facet search function. 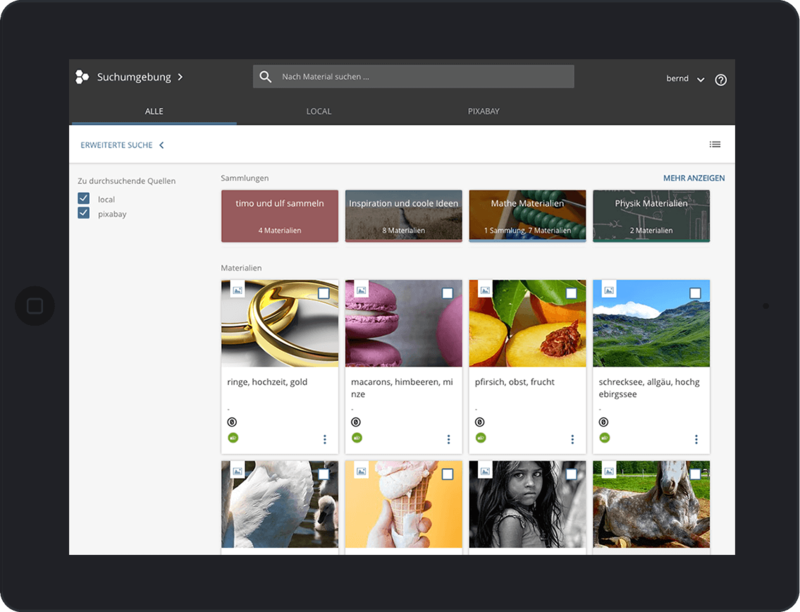 Using search options such as school type, subject, age group or subject, users will quickly find the perfect content for their course. After the installation of the edu-sharing plug-in, the edu-sharing search is available in the material options of your learning environment and as a function of the text editor. 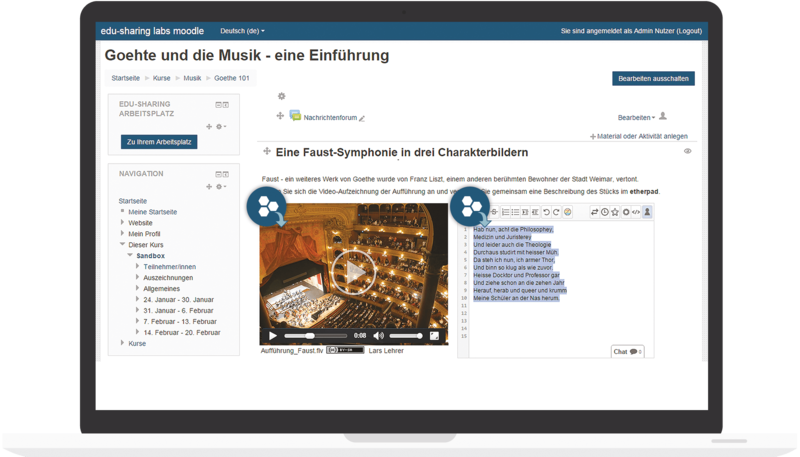 Media and tools, such as etherpad, are either linked as resources in the course or embedded in text fields of your courses. For free content that is under a Creative Commons license, edu-sharing automatically displays the author and license correctly. edu-sharing plug-ins are available for many systems like Moodle, OLAT, ILIAS and MediaWiki. Your system is not included? No problem, edu-sharing is open source and can therefore easily be connected to your system. Does your LMS support the integration of complex content formats, such as QTI assessments, or modern tools, such as Etherpad? Using the edu-sharing rendering service it does! It enables the use of these and a variety of other content and tools - even on mobile devices. For complex objects, such as etherpads or moodle courses, edu-sharing creates special instances of these objects restricted to users with the corresponding permissions. edu-sharing checks access rights and counts usage transactions for notifications to publishers or collecting societies.